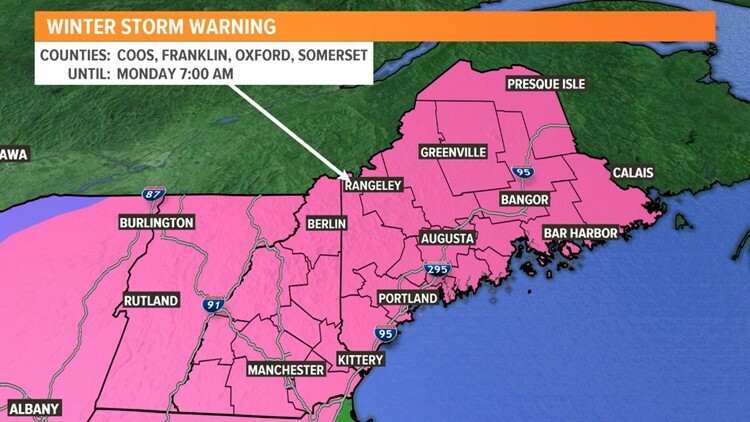 Maine weather strikes again. Areas of heavy snow will move in after sunset, and overspread the area into Sunday. We're talking anywhere between one to up to two feet of snow in accumulation. Well, today is the day to prepare. The first major winter storm of the season moves in after sunset, tonight. 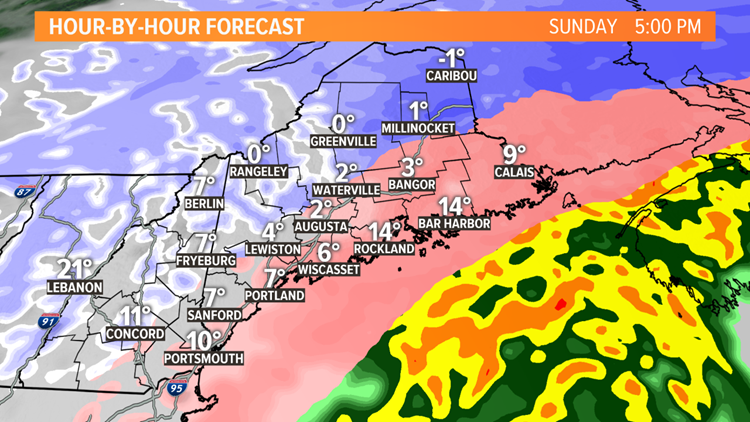 Heavy snow will continue through all of Sunday. Travel will be very dangerous to near impossible. Sun will fade and clouds will increase through Saturday afternoon. SATURDAY NIGHT: Snow should start to break out into New Hampshire and far Southern Maine around 7 PM. The rest of the state stays quiet, but that will quickly change through the evening and overnight hours. SUNDAY MORNING: Sunday morning will be a mess. Snow will blanket much of the state, by 5 AM. Snowfall rates could be anywhere between 1-3 inches of snow an hour. Travel will be dangerous to near impossible. If you can stay home, just do it. 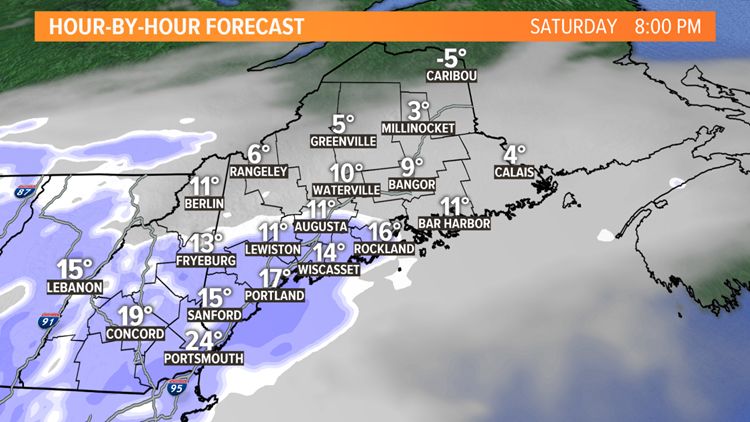 Winds will help to blow the snow, which will reduce visibility even more. 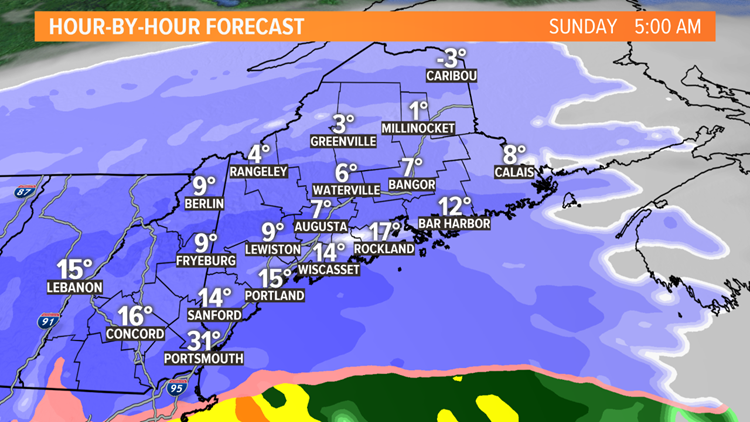 SUNDAY AFTERNOON: Snow will still be coming down at a good clip into the afternoon. Some sleet will start to mix in closer to the coast. We may get some pockets of freezing rain as well. This may keep snow totals down a bit, but we're still talking a decent amount of snow. SUNDAY EVENING: Areas of snow and a wintry mix will continue. Parts of the southern half of the state, will start to see the precipitation let up a bit. It'll be gusty, so there is still the issue of blowing and drifting snow. Travel is still NOT recommended. If you have to be out, PLEASE be careful. 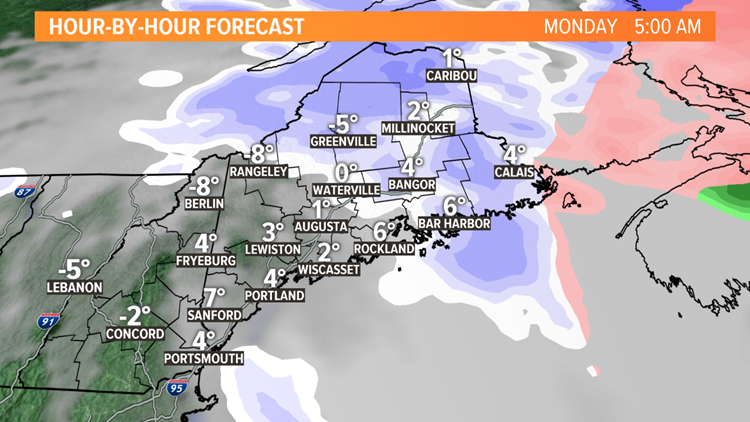 MONDAY MORNING: Any precipitation should continue to move to the northeast. A few lingering snow showers are still possible. Otherwise, it'll stay windy. Blowing snow still a hazard. It'll stay cold, too. Wind chills will be near zero or well below zero. The National Weather Service does have a winter storm warning in place until early Monday. This is for the entire state of Maine and for all of New Hampshire. Some minor to moderate coastal flooding is also a concern, especially for the southern coast of Maine and coastal New Hampshire. High tide will be around 9-10 AM, Sunday morning. A coastal flood watch is in effect. 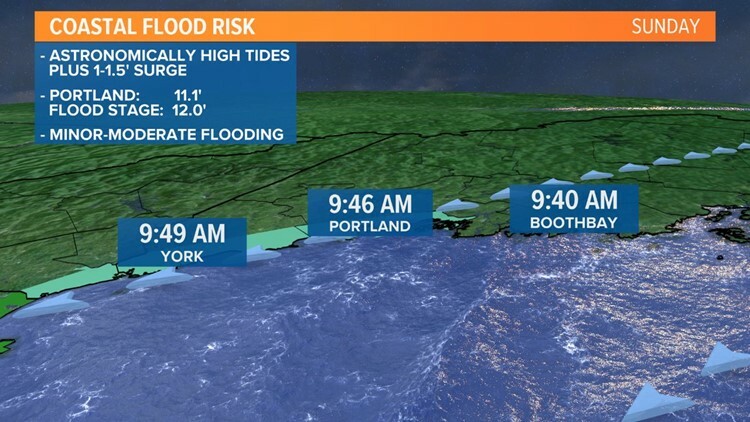 Risk of coastal flooding, Sunday. 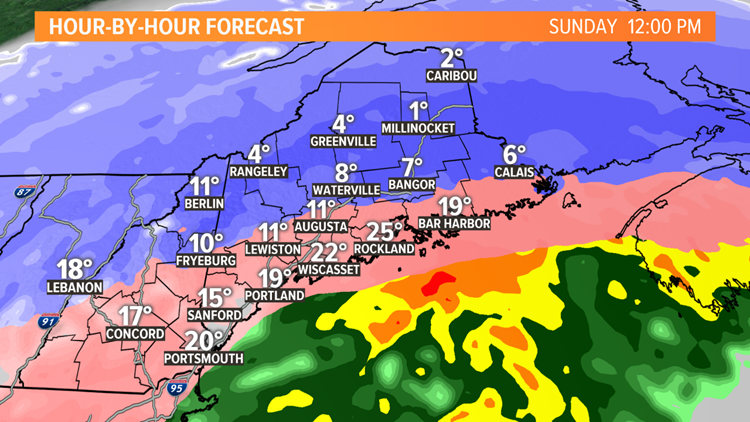 Be sure to download the NEWS CENTER Maine app, and tune into our newscasts through the rest of the weekend. We will have extended coverage for you on Sunday to help keep you informed.